Sometimes things get trown at you like a ton of bricks. They may be hard to take but you have no other option other than to accept them for what they are and deal with it. Other people need you and yes, your feelings matter and are important but they are not what important at that very moment. I am a firm believer in “Everything Happens For a Reason”. Bad things happen for a reason, good things happen for a reason. When something not so great happens its because something better will happen later down the road. The bad things are paving the way for the good things to come. I have proof of this. So when something bad happens I can only get through it knowing that something good is coming soon. My heart is breaking but I have no other option other than to think positively and know that what is happening is for a reason. My grandfather was just diagnosed with stage three cancer. That is all we know. We do not know anything more until he talks to the doctor. He doesnt even know yet. This will devistate him. It devistates us!!! I has been a year and a few weeks since my grandmother passed. Its no coincidence this is happening. I am not a religous person but I do believe that there is a heaven. I know my Grandmother is up there saying “come on dad, I am getting lonely up here.”. She always called him dad. I guess after five kids, seven grand children and five great grand children it would make sense she would call him that. I can not be selfish in this. I want him here with us and healthy as ever but I know I cant have my way. I have had a beautiful 28 (almost 29) years with him. I am lucky. I have lost three grandmothers and he is my only living grandparent. It breaks my heart to know that they will all be gone but I know they lived long lives. I was lucky to have what I had. Owen is lucky to have had the chance to know his great grandparents. 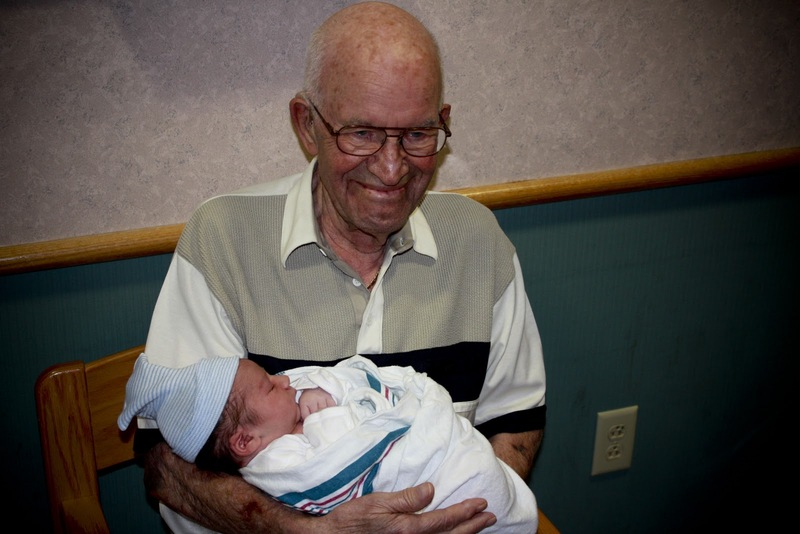 Poppy got to meet his newest grandson so he can go up to heaven and tell mama just how precious he is!